Spirituality is ingrained in Eastern culture, and has drawn seekers, worshippers, and students for many years. It certainly attracted German multi-instrumentalist Felix Maria Woschek, who came to the vast perfumed expanses of India to study its music. There he began his longtime collaboration with Ustad Sultan Khan. Khan is part of a generation of Indian musicians who have strong classical backgrounds and are unafraid to incorporate them in their embracing of newer genres, reciprocating the sentiments of the Western musicians. Trained in the sarangi (a classical Indian stringed instrument) by his musician father Ustad Gulab Khan, Khan has been performing since age 11; his debut concert was at the All Indian Conferences. He is the receiver of numerous awards, including the Sangeet Natak Akademi Award, given by India’s National Academy of Music. The two have collaborated on various projects for Woschek’s own label, Woschek Spiritual Sounds. The musicians‘ desire to give with their music is apparent in their 1996 album Amba: A Love Chant. There is love in both tracks of this album, that for the divine mother and that for the people of Tibet, with each song inspiring you to carry out acts of love and compassion toward others. In the 45-minute „Amba,“ electric guitar and saxophone blend seamlessly with sarangi and strings to serenade the holy feminine power that is Amba. Male and female vocals join together in harmony, allowing both sexes to sing praises to and benefit from the presence of this universal mother. „Free Tibet“ has a more somber reverential tone though the intent of love and respect is no less prevalent. Low, guttural chants create a resonating bassline that hints mournfully at the loss of human rights, while deep male vocals echo and reverberate at a higher frequency, instilling a sense of awe for the history and spiritual culture that comes from Tibet. Though slow and solemn, the echoes of voices and high-hitting string notes create a sense of balance and hope. love and sympathy. Brilliantly, and in a most enchanting manner, one is transported into another world of healing and wonder. A world that is very gentle indeed, and the repetitive nature of song, sound and melody is very conducive to meditation. Track two, “Free Tibet”, is somewhat different. An interesting interpretation of the Om Mani Padme Hum, combined with original Tibetan chanting, is very meditative in quality. This beautiful illustrated CD is pleasing to the touch and eye, and comes highly recommended for the discerning listener. Spirituality is ingrained in Eastern culture, and has drawn seekers, worshippers, and students for many years. It certainly attracted German multi-instrumentalist Felix Maria Woschek, who came to the vast perfumed expanses of India to study its music. There he began his longtime collaboration with Ustad Sultan Khan. Khan is part of a generation of Indian musicians who have strong classical backgrounds and are unafraid to incorporate them in their embracing of newer genres, reciprocating the sentiments of the Western musicians. Trained in the sarangi (a classical Indian stringed instrument) by his musician father Ustad Gulab Khan, Khan has been performing since age 11; his debut concert was at the All Indian Conferences. He is the receiver of numerous awards, including the Sangeet Natak Akademi Award, given by India’s National Academy of Music. The two have collaborated on various projects for Woschek’s own label, Woschek Spiritual Sounds. 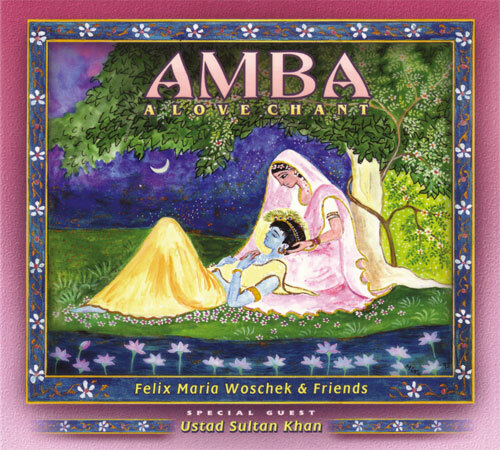 The musicians‘ desire to give with their music is apparent in their 1996 album Amba: A Love Chant. There is love in both tracks of this album, that for the divine mother and that for the people of Tibet, with each song inspiring you to carry out acts of love and compassion toward others. In the 45-minute „Amba,“ electric guitar and saxophone blend seamlessly with sarangi and strings to serenade the holy feminine power that is Amba. Male and female vocals join together in harmony, allowing both sexes to sing praises to and benefit from the presence of this universal mother. “Free Tibet“ has a more somber reverential tone though the intent of love and respect is no less prevalent. Low, guttural chants create a resonating bassline that hints mournfully at the loss of human rights, while deep male vocals echo and reverberate at a higher frequency, instilling a sense of awe for the history and spiritual culture that comes from Tibet. Though slow and solemn, the echoes of voices and high-hitting string notes create a sense of balance and hope. Wonderful music that touches the heart directly. In the title piece, which lasts for more than 45 minutes, the divine Mother AMBA is worshipped together with other Indian goddesses as the protector and source of love. A successful synthesis of western and eastern music, ideally suitable for joining in with the singing. The second song, „Free Tibet“, contains healing Tibetan mantras and is dedicated to the liberation of Tibet. This CD possesses depth, endows the listener with strength, and because it is ideally suitable for relaxation or to accompany various therapies and meditations it has become an essential part of many workshops.